I searched for a photograph where my old ponytail could clearly be seen, but the best I could find was a still screenshot from an interview I did with Andi White at IATEFL 2011. I had only intended to show this and move on to doing something else entirely in the lesson, though. When I came into class the students asked if I had photographic evidence and I whipped out the picture. I pinned it to the whiteboard and invited the students to come and look at it. Some students were amazed at how different I looked – which led to teaching them mustache, beard, goatee, and I wouldn’t have recognised you! What was the name of the interviewer? I checked the students understood that although the questions were different, the answer they got would be the same. Then I asked the students to continue asking me questions, but on paper. I organized teams of four and assigned a group scribe, and a “runner” to pass me the questions when they were hot off the press. If the question was well-formed I would answer; if there was anything technically wrong with the question I would highlight this and they should revise it. Then we set to work. I had envisaged 5 minutes for this stage but it took closer to 15, partly because one team was very productive in their questions while the other were more thoughtful and cautious, and so needed more time to gather information, but also because I was fascinated by the line their questioning took. I had imagined they would ask about logistical matters like where I was at the time, etc, but quickly their questions turned to the topic of the interview. This led to them interviewing me about the history of Dogme ELT (“teaching without a coursebook”) and my relationship to it. Where did you do the interview? In Brighton, UK. What was the subject of the interview? 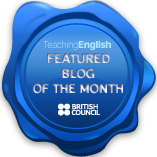 We talked about ways to teach English without using coursebooks. How long did it take? It was about 20 minutes. Had he Did you have any experience befor(e) the interview with teaching without books? Yes, I did it a lot. Where was you teaching? In London, and then Berlin. How long has he (actually meaning me, which I misinterpreted as meaning Andi, hence the answer I give) worked before as a teacher? I don’t know, but at least 6-7 years. What did you do in this time? As a teacher? (meaning, in what capacity was I being interviewed – a very astute question.) As a teacher-trainer. How was this idea born (teach Englisch without Books? Someone called Scott Thornbury suggested it in 1989. I thought it was a good idea. How many people was involved at first? In 1989, only 100 teachers around the world, now thousands. Could you explain (just short) about the conclus(s)ion? I won! (I think!) Andi agreed with me! With whom did you do the interview? Andi White. No, we mean, were you alone? Ah! Yes. Did you get nervous? Yes, very! It was live on the internet. Which website was that? The British Council IATEFL 2011 Conference website. Did you get any media coaching before? No – and it is obvious when you watch it! Did you get paid? No, unfortunately! Was that your first interview? No, that was in 2010. Did you have another interview after that? Yes, the next year. How many viewers did you get? I don’t know, but they told me a lot of people watched it. About 3000, I think. How did your family react?/did your family watch it? Yes, my mum was very proud! With about 10 minutes to go, I pulled the whiteboard into the middle of the room and passed a board pen to each team. In 1989 only 100 teachers around the world were familiar with that kind of teaching. The idea was creatived by Scott Thornbury. Anthony likes this idea and took it on. In London and Berlin he taught for 16 years before the interview. Anthony won! What struck me was how little the students needed me, despite the amount of recasting and recompositioning of my answers they were doing while composing their own texts. Reading the stories was very moving, and I thought that the two people mentioned in the story – Scott Thornbury and Andi White – might like to see the outcomes, so here they are. Andi, Scott, if you have the time, I’d really appreciate it if you could quickly write back to my students! Yes, it’s all true (apart from some mix-up with the dates) and let me be the first to congratulate you for getting this really interesting story out of Anthony. The exercise you just did in asking Anthony questions and writing texts based on them) shows how much can be achieved through a combination of curiosity, collaboration and (judicious) intervention on the part of the teacher, rather than reliance on traditional coursebooks. (Anthony will explain any of those long, Latinate words, if they are new to you). Wow, well done! You asked great questions. You could have my job and Anthony’s soon too by the looks of it. I have only one issue. Can you guess what it is? It starts with “w” and ends with “in” and has to do with Anthony and me. Please let me know why you think I might have a problem with this and I’ll tell you if your right or not. And I agree with Scott about Anthony’s beautiful new ‘do! Hi Andi – thanks for writing back! What did you do with the final texts? . I used to do something similar in my first-day TP demo lesson in Phuket. I would have the TP SS, in groups, write a travel plan for one of the trainee teachers. They would first interview the trainee and find out what they liked to do, interests, etc. Then, write a one-day plan; to give them some ideas, I gathered brochures, maps, itineraries from local travel agencies. I found it a informative exercise for building rapport. Thanks for writing, Derek. The students wrote the texts up on the whiteboard (see pictures) and then read the other group’s work. They then pointed out what information was different in the other group’s text. If I’d had more time, I might have asked the students to “reverse-engineer” the questions that the other group might have asked to obtain the information that they did. Your brochure lesson idea is really interesting, and is similar to some other reading/speaking lesson ideas I have, like interviewing a class colleague about their reading habits (or those of someone they know) and then reading a range of book jacket blurbs (or similar) under time pressure to select a suitable birthday gift for them. Great post Anthony. A timely remind for myself as I reflect on this years teaching. It’s made me realise how much I missed doing this kind of thing and how much it has been missing from my class room. Thanks, Adam. I’m fortunate to have the freedom to do this kind of thing quite a lot, I suppose, but as I have also started working on rather formalised intensive courses again as well, it’s becoming an interesting exercise to discover ways of achieving planned objectives with as little stuff as possible. What a fascinating lesson! What can I say? The one’s that hit are just sublime. Thanks for the rhyming comment! Another Anthony quotable! Could hang this one in a teachers’ room at the end of the year, to remind us all why we keep coming back for more! (You could post that as a kind of challenge – comment in rhyme on this! ).